Dayton Boat Club’s women’s four, from left: Amy O’Connor, Judi DeSimio (coxswain), Maureen Schlangen, Susan Federinko, Jane Wittmann. The quartet earned first-place gold at the Frogtown Regatta, Sept. 22 in Toledo. 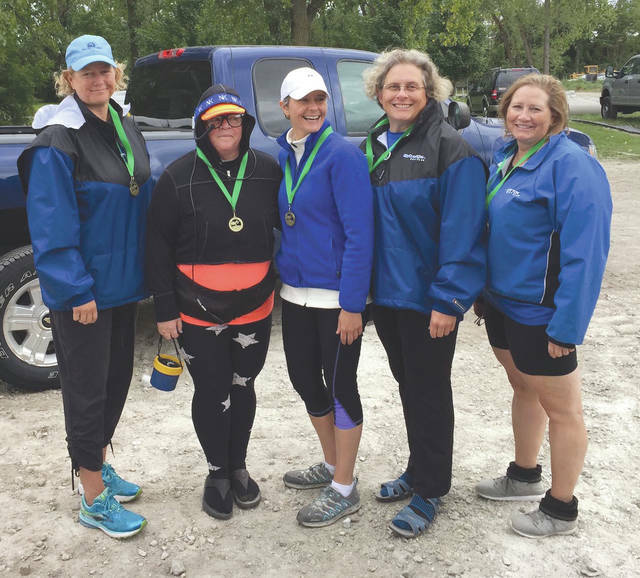 TOLEDO — The Dayton Boat Club Masters adult rowing team brought home medals in all four of its events Sept. 22 at the Frogtown Regatta. Several rowers with Greene County area ties were on hand to compete for the DBC. The women’s four took gold; the men’s four, the women’s eight and the mixed eight all took silver. The 3,000-meter course on the Maumee River went north from the Interstate 75 bridge to International Park in downtown Toledo, just south of where the river empties into Lake Erie. Frogtown was the first regatta for Tara Poteet of Kettering and the first masters race for Rachel Cubbage of Oakwood. Both took DBC’s learn-to-row class in April and spent the summer on the novice team; they rowed in the women’s eight and the mixed eight. Other DBC rowers at the regatta included Luke Nelson of Beavercreek; Susan Federinko, Pete Hoshor and Timmy Wells of Centerville; Becky Rounds of Dayton (coxswain); Judi DeSimio of Fairborn (coxswain); Maureen Schlangen of Kettering; Mick Armitage, Vince Leopold, Jennifer Speed and Jane Wittmann of Oakwood; Marty Carrabine and Julie Carrabine (coach) of Springboro; and Amy O’Connor of Troy. The DBC masters rowing program welcomes new and experienced rowers ages 21 and older; indoor training starts in early December at the downtown Dayton YMCA. The club also offers programs for boys and girls ages 12 to 18 and a U23 program for ages 19 to 22. For more information about the Dayton Boat Club, go to the club website at daytonboatclub.org.